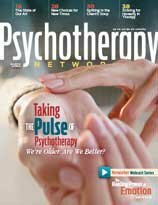 There’s been a decline in the public’s utilization of psychotherapy as a consequence of the rise of what might be called the Gang of Three: DSM, Big Pharma, and Managed Care. Today, we appear to be an atomized and poorly organized field that’s lost economic ground to other approaches promising mental health consumers improved well-being. But while recognizing the missed opportunities and missteps we’ve made as a profession, the contributors to this issue also point to what we need to do to make a more concerted and effective stand to reclaim lost territory. To move forward, our profession needs a more consistent message about what we have to offer. Manualized psychotherapy is squeezing out people on the margins of mainstream society. Therapists are far more impressed with clinical fads than they should be. Let’s unite to stand up to vested interests that have taken over the mental health system. In our profession, it’s often more alluring to explore new gimmicks than to acknowledge that our success largely hinges on simple, commonsense factors. Anticipating endings may encourage us to grasp the present with greater vitality. What clinical, ethical, and legal issues should we be considering as distance therapy becomes a more common form of practice? Despite its popularity among therapists, mindfulness is only a beginning in the process of change. Finding an exit from the bewildering maze of a disorder that confounds many clinicians. Sometimes chance encounters can change a life.